Most apartments lack any land to call your own, and if you have a green thumb, that can be a great disappointment. Fortunately, there are many plants that can thrive in apartments, even with a ton of sunlight or water. Plants can improve aesthetics and enhance indoor air quality for little cost, so putting them in your apartment is a no-brainer. The spider-plant can spruce up any living area with plentiful natural sunlight and only needs occasional pruning. A small bonsai can create a Zen-like atmosphere in any bright sun-lit room, and they’re perfect for a small countertop or table. If you’ve got limited sunlight, consider bringing in a Chinese Evergreen. They are great for beginners, tolerant of many light ranges, and will likely live for years. African Violets are easy and only need indirect sunlight. They consume small amounts of water, so if you travel or are often out of the house, they’re perfect for you. 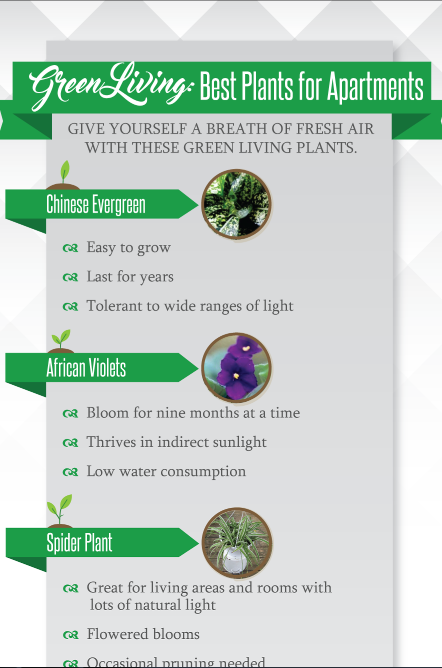 Trinity Commons at Erwin has put together a great infographic to help you decide which plants are best for your new apartment home.